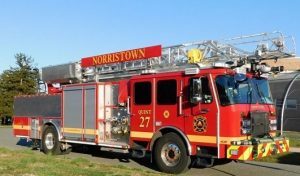 Students from Norristown Area School District participated in a contest to name the newest member of the fleet, Quint 27. After careful consideration, Municipal Council selected the name given by Ivan Garcia from Stewart Middle School. Quint 27 will now be named Phoenix! See Phoenix this Saturday, April 6th during Norristown Day at Elmwood Park.